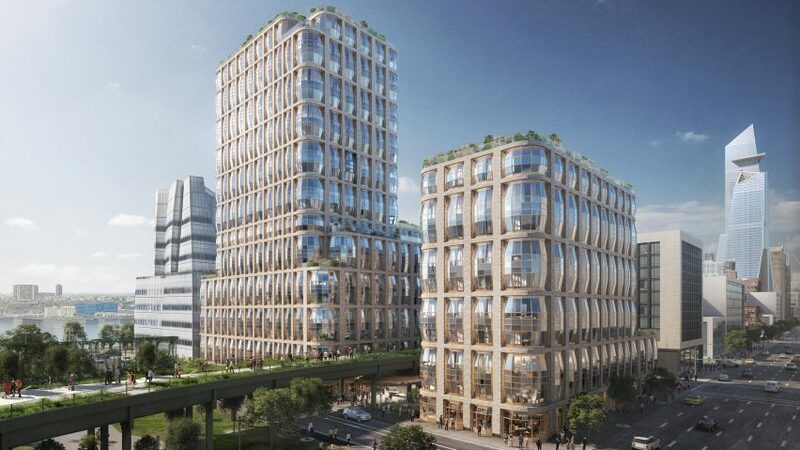 British designer Thomas Heatherwick has unveiled a pair of residential towers to straddle New York's High Line park, which will feature barrel-shaped windows that resemble those at his studio's recently completed hotel in Cape Town. Heatherwick Studio designed the two towers to be built on either side of the High Line, at 515 West 18th Street in Manhattan's Chelsea neighbourhood. Although different in height and shape, both will feature gridded exteriors based on the facades of warehouses in the area. Newly released renderings show windows made of glass panels that slant at the top, bottom and sides to create the curved shaped that appears to bulge between the masonry walls – resembling insect eyes. Heatherwick used similar faceted glazing on his luxury hotel inside a former grain silo in Cape Town, which sits above the Zeitz MOCAA art museum also completed by the British designer last year. The New York condominiums were commissioned by Related Companies, the developer behind Zaha Hadid Architects' 520 West 28th building further up the High Line. The 515 West 18th Street development will be close to Chelsea's art gallery district, and have views towards the Hudson River. Its two towers will be linked underneath the elevated park and together host a total of 180 residences, ranging from one to four bedrooms. Little information has so far been released about the project, though one of the towers will be 21 storeys high and have a stepped shape. Reports claim that the other will rise 10 storeys. Images also show that both will be topped with vegetation, perhaps providing roof gardens for residents. Related Companies is also building a high-rise on West 23rd Street. Together, the two projects are currently known as the Hudson Residences. At the northern end of the High Line in the vast Hudson Yards development, Heatherwick's structure comprising levels of interconnected staircases is nearing completion. The British designer's other projects in New York have encountered a series of misfortunes. His plans for Pier 55, a "treasure island park on the Hudson River", were abandoned towards the end of last year. Media mogul Barry Diller, who was funding the project, then set about to build the scheme, although its future remains uncertain. Heatherwick's overhaul of New York Philharmonic concert hall was also scrapped last year in favour for a less drastic alternative.